It is the lot of a few churches to be instantly recognisable, and there is nothing else in East Anglia quite like the great bulk of St Spyridon. 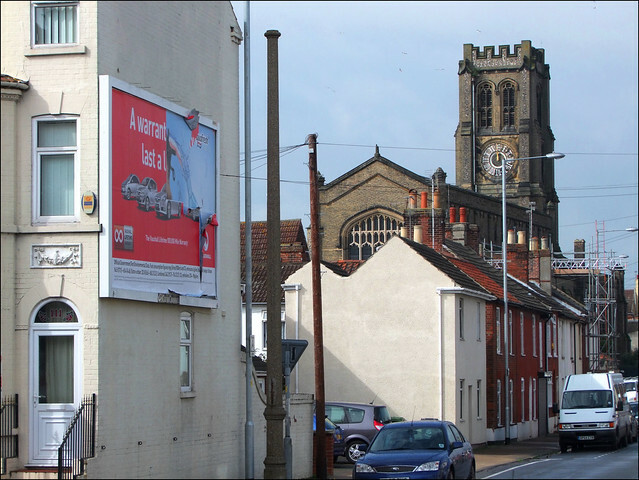 The white brick with flint panelling, the narrow hunched aisles and the great soaring tower, the curious clock, would have fingers reaching for the buttons immediately on any quiz about Norfolk's urban churches. Its setting in the low Victorian terraced streets of south Yarmouth, a short walk from the sea front, makes it seem even more imposing. As the region's largest seaside town, it is not surprising that a relatively large percentage of Great Yarmouth's population is Greek in origin. Indeed, it is probably East Anglia's largest Greek community outside of Cambridge and Norwich. Many of those here are Greek Cypriots, who came to England during the war and fascist dictatorship of the early 1970s to join an already established community working in the restaurant trade and other service industries. 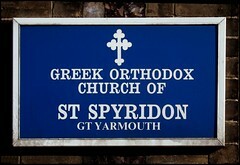 St Spyridon is the community's Orthodox church, one of barely half a dozen Orthodox churches in Norfolk. 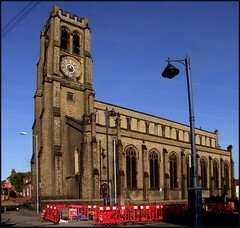 This was the Anglican parish church of St Peter originally, and the building's jaunty character is a consequence of its construction in the early 1830s; it is, in fact, a Georgian church, and was built before the rows of terraced houses were laid out around it. 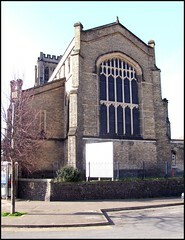 The architect was that prolific Yarmouth church builder JJ Scoles, and this was an early work of his. He was also responsible for the rather more ecclesiologically correct Catholic church of St Mary a short walk away, as well as the charming church of St Mary in Southtown. Three very different churches built over a period of less than twenty years, suggesting that Mr Scoles was an adaptable chap. There is a concentration of 19th century churches in south Yarmouth, and it is not surprising that almost all of them have now been declared redundant. 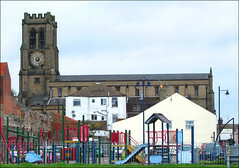 St Peter was the first to go, falling out of use in the 1960s. The Greek community were in possession by 1964, and the dedication plaque above the west door records that the building was formally dedicated in April 1983. 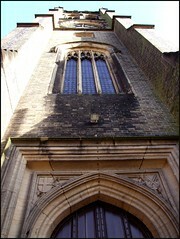 It is a large structure, its nave and tower lifting forcefully and creating an impression of height, but it is not a wide church. If the aisles seem perfunctory it is because they were intended to accomodate a gallery, which runs around three sides of the interior. This is a reminder that the building predates the Oxford Movement's successful attempt to restore sacramentalism to the Church of England, and that first and foremost St Peter was built and intended as a preaching house. Pevsner declared the church large and uncommonly dull, noting that it was built through the aid of the second parliamentary grant at a cost of £7,735, about one and a half million pounds in today's money. Over the next decades the starkness of the building was ameliorated somewhat by the insertion of some very good glass, some by the Kempe workshop. 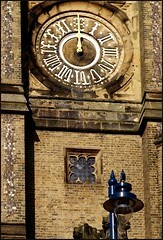 Intriguingly, the tower had pinnacles, but they were removed as dangerous as early as 1860. The interior of the present-day church is still large, but it is certainly not uncommonly dull. It is full of the colour and vigour of the Greek Orthodox Church. Most strikingly, of course, the altar and sanctuary are screened by a vast iconostasis painted with Saints. It must surely predate the 1960s in construction, and must have been brought here from elsewhere. Rather startlingly, the arcades have been filled in on both sides of the nave to create rooms under the galleries. Above, these are screened off rather unsatisfactorily with blue plastic sheeting, presumably a temporary measure. On the walls of the infill, to north and south, are dozens of large icons of Saints. It is a beautiful place to wander, despite the plastic sheeting. I came here on Heritage Open Day, and the man on duty was very welcoming, explaining to me that the building took a lot of looking after as it was a hundred years old - in fact, it is now nearly two hundred. He was happy for me to take photographs, which has never been my experience in an Orthodox church before as photography is generally considered disrespectful to the icons. As I wandered about, there was a constant flow of people in and out of the building, visiting the church office and other meeting rooms along the arcades. It felt like a busy, happy community. 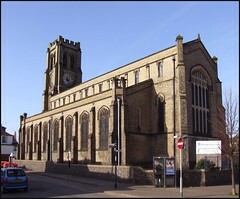 Nineteenth century churches declared redundant in the 1960s did not generally suffer the same happy fate as this one. 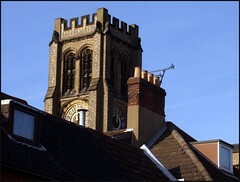 Many were demolished, including two a few miles off in Lowestoft. Incredibly, the wonderful and nationally significant Arts and Crafts church of All Saints in central Cambridge was granted a demolition order before being rescued by conservationists and campaigners. All Saints stands empty today, a museum piece: but, thanks to the lively Greek community of Great Yarmouth, St Spyridon is full of life.